Lucy’s great escape took her from Egypt to Philadelphia, all with a broken jaw. If you met Lucy today, you'd see a playful pup eager to lick your hand. What you wouldn't see is her painful past, which involved thousands of miles of travel and a faked death to escape an abusive owner. In an effort to find Lucy a forever home, the Special Needs Animal Rescue and Rehabilitation, a U.S.-based nonprofit that works with international animal shelters, is sharing her inspiring story. Last October, SNARR received a call from a sister shelter in Egypt, asking for their help. 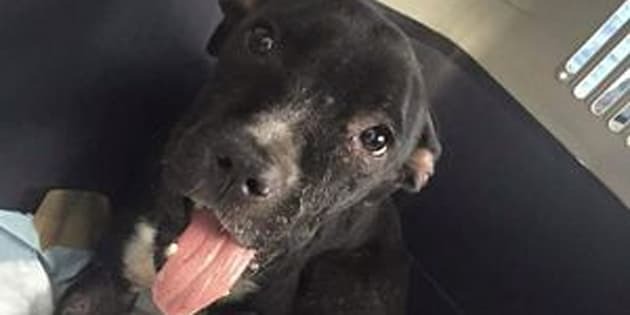 Workers at the Egypt shelter knew of a young, purebred pit bull that was undernourished and covered with infections, and that had been beaten by her owner so badly, her jaw was broken. The workers wanted to rescue her, but they faced a problem: The dog's owner was their landlord, with whom they shared a property. After the owner rejected their offer to take the dog under their care, the shelter workers devised a plan that wouldn't upset the abusive owner or risk the shelter losing its rented space. They called SNARR and arranged to have the injured dog sent to the organization's Philadelphia-based coordinator via a volunteer traveler who'd take her to New York. "The shelter had to be very careful when getting the dog [off the property]," Lauren Connelly, SNARR's foster coordinator, told The Huffington Post. "If they made the man mad, then the shelter couldn’t exist" -- which would put all the animals under their care at risk. So the volunteers waited until the owner left his property. Then they took the pup and sent her off to America. When the owner returned home, the shelter workers told him the dog had died. According to Connelly, the owner never asked any questions about the dog. By the time the dog reached Connelly in Philadelphia, her condition was dire. The young pit bull's skin and her broken jaw were infected, and she was too afraid to leave her crate. "The smell of [Lucy's] infection would turn your stomach, it was awful," Connelly told HuffPost. "Her jaw was so painful, she couldn't eat. We had to make dog food soup so she can lick it up with her tongue." When Connelly brought Lucy -- as she'd named the pit bull -- to the veterinarian, professionals confirmed her violent past. "The vet said that the jaw was broken in two places," Connelly said -- and the breaks appeared to be the result of blunt force. "She was either kicked or hit with something strong like a brick." After reconstructive jaw surgery, antibiotics and months of recovery, Lucy is finally living a love-filled life in Pittsburgh, in the foster care of a family with three young children. By all accounts, Lucy is a very social 1-year-old pup with a happy-go-lucky personality. Her only issue is that she is initially frightened by men. "Something to be aware of is that she is timid, especially around adult males (being abused by a man, this is not surprising)," SNARR workers explained in a Facebook post last week. "She does not become aggressive, but withdraws acting timid, shy, and hiding." But once she warms up to someone, Connelly says, Lucy is the friendliest dog you'll ever meet. She loves to cuddle and lick people so much, SNARR shelter workers lovingly call her "Licky Lou." "She’s just like any other dog now," Connelly told HuffPost. "You'd never know that anything had happened to her." If you're interested in adopting Lucy, SNARR will transport her to approved families anywhere in the U.S. You can find the group's contact information here.